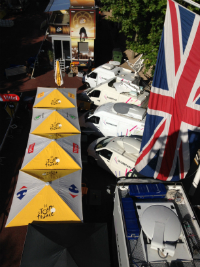 Tour de France: Globecast SNG satellite production. Paris, July 2014: Globecast has once again helped bring innovative and dramatic coverage of one of the world’s most iconic sporting events – the Tour de France – to TV screens both across France and internationally. Globecast provides the satellite infrastructure for the event, with signals being sent via microwave from multiple motorbikes along the route to a helicopter and a plane. These signals are then transmitted – again via microwave – to a stationary Globecast SNG unit out in the countryside. In turn, that sends all the signals via satellite to the production facilities at the finish line. Directors there can use talkback to provide instruction to the motorcycle cameramen. Globecast provided a live feed for use both nationally and internationally.